Pioneers in the industry, we offer lcd writing tablet. from India. For business people, designers, Engineers, teachers and doctors. As the family message board, can be placed on the table and desk. Class notes, drafts, and scientific equations to solve mathematical problems. Easy to cultivate children’s writing, calculus, painting ability, simple, cleanly and interesting. Light and easy to carry, and can be recycled, can let deaf people communicate easier. 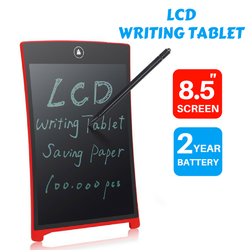 Looking for LCD Writing Tablet ?